Ken Wilber and friends Terry Patten, Adam Leonard, and Marco Morelli have written a ground-breaking, powerful, and important guide to self-development. 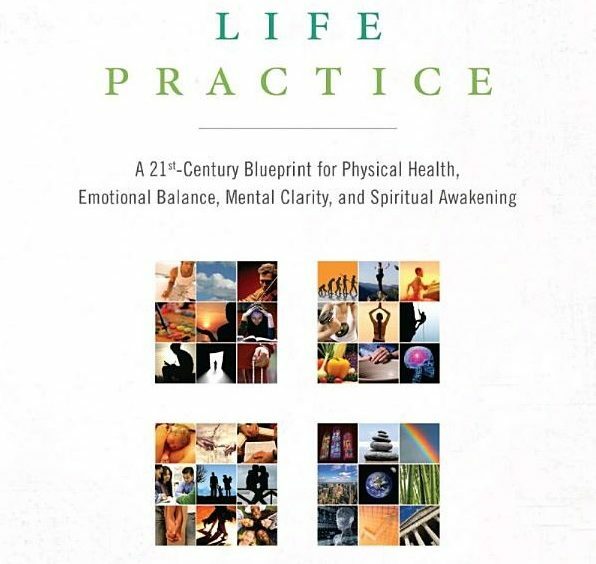 Subtitled, “A 21st Century Blueprint for Physical Health, Emotional Balance, Mental Clarity, and Spritual Awakening, Integral Life Practice answers the age-old question: “How do I know what to focus on in the limited time I have in my busy life to make the most progress in becoming the person I know I am meant to be?” After reviewing the many strengths of this text we will use it to explain a basic limitation of self-help and goal-setting texts, seminars, and programs and to introduce the reader to an approach that addresses that limitation. Beginning in 1977 with his first book, The Spectrum of Consciousness, Wilber has taken into account three ways of knowing. The first is called “analogic” or the via affirmativa. It states what is true and false: “God is omniscient, omnipotent, omnipresent.” “A red light means stop.” “Alligators have teeth.” It states things have being; it tells what a thing is. It tells you what you are looking for. The second way to know what is true is called the via negativa. It says that what is ultimately true cannot be described. The technical term for this is ineffability. It says that the way you know the truth is by something other than thinking, feeling, sensing, or knowing. But what could that be? Isn’t that pretty much everything? Yes, and that’s exactly the point. The via negativa says, “When you’re busy naming every tree and bush, you miss the forest. Stop. Back off. See what opens up.” Perhaps the crowning statement and greatest advocate of this approach was Nagarjuna, the great Madhyamika Mahayana Buddhist mystic and philosopher who lived in northeastern India in the second century. The third approach to knowledge is called the injunctive. It says that truth is best found by following a set of instructions, called injunctions, that say, “If you want to learn that, do this.” Directions are injunctions. “If you want to get to the bank take a left at the next corner.” Yogas are spiritual injunctions that say, “If you want to become one with the divine, do this.” Kundalini yoga says, “If you want to know Brahman, do these breathing exercises.” Karma yoga says, “If you want to know God, turn your daily work into a devotional practice.” What is interesting about injunctive methods is that they are operationally defined. That means that you don’t have to believe anybody or in anything, as you have to do with the via affirmativa. You don’t have to give up anything or anyone, as you usually end up doing with the via negativa. The injunctive method is in the tradition of Buddha, who famously said, Believe nothing, no matter where you read it, or who said it, no matter if I have said it, unless it agrees with your own reason and your own common sense. Wilber’s Integral Life Practice belongs to this injunctive school of knowing. It says, “If you want to speed your development, do these exercises.” While it is not intrinsically a yoga, in that you do not have to want to become one with the divine to succeed at any of these simple activities, your ILP can be approached in that context if you so desire. It’s up to you. Also, you don’t have to believe Wilber or his co-authors. You don’t have to trust the integral method or understand the AQAL model. You can think all of that is hooey or the work of the Devil and decide for yourself. In other words, Wilber’s opinions and yours really don’t matter with injunctive methods. As the old, overworked addage goes, “The proof is in the pudding.” Does it taste good or not? When you follow the ILP instructions, does your life get better or not? I am betting that it will. But don’t trust me, either! The short answer is, “No.” It is better to start a practice with what knowledge you have now than to procrastinate, telling yourself you first need to have a proper understanding, the right place, and plenty of time. There is never going to be a better time to get started than now. Throughout his various books and interviews Wilber is clear that his own understanding is partial and incomplete. He’s continuously revising his world view and approach to life, based on new information. However, partial knowledge has never stopped him from starting and improving on his own integral life practice and it shouldn’t stop you, either. For a quick overview of his extraordinarily insightful and helpful AQAL model, read chapters 2 and 3 of ILP. Wilber and company have worked hard at distilling the sophisticated, intellectually broad and deep theoretical foundation of his work into a bare bones overview. If you want to take your understanding of AQAL to the next level, his A Brief History of Everything would be a good next step. To get started with your own integral life practice, the best approach is to pull one or two nuggets out of this terrific book and use them today. Try out four “no excuses” one-minute exercises, one from each of the four core ILP areas: Body, Mind, Spirit, and Shadow. That’s balanced, substantial growth in four core life areas in four minutes. However, before you charge out in a burst of enthusiasm to get started, Let me warn you that you have good reasons why you are stuck where you are. Like a gyroscope, your inertia maintains you where you are, even though you are in constant motion. You are comfortable and stable in your present level of discomfort and instability. The dysfunctionality of your stuckness has survival value. Right now, before you start your integral life practice, you are at one with your motivation; your resistance is asleep. Guess what will wake up when you start down that road paved with good intentions? In psychology this is called the approach-avoidance gradient: if you persist in your integral life practice, at some point you will reach your point of maximum resistance. If you break off there, guess what will be stronger the next time you try? Like those fat cells when you go on a diet but then break it off, you’ve taught them to be resourceful, more resistant, and resiliant. So learning to expect resistance and knowing how to make it your friend is core wisdom for any integral life practice. Wilber’s version handles this with the Shadow component of the ILP. In it you learn to listen to what your resistance has to say to you. By so doing you move out of opposition with yourself; you align yourself with that part of your alienated power that it represents. If you never reach any of your goals using Wilber’s ILP but just learn how to listen to your resistance, you are miles farther down the road to personal development than you were before. Why? Because realistically, you are not likely to accomplish your other goals until you first set the goal to listen to and learn from resistance to any and all goals. The good news is that you don’t have to start from scratch in figuring out how to best grow. It’s been done before. Everything you are going to think through while setting up and improving your integral life practice has been thought through before. A lot of what time and experience has taught others is already in this book. You can save yourself detours in your personal growth if you get this book and take it for a serious test drive. So, how to you make the most out of Integral Life Practice? The broader question is, “How do you make the most out of any self-help book?” The common answer is the injunctive one that we have already learned: follow its instructions and see what happens in your life. However, the problem is a deeper one. It revolves around the question, “Who do I trust?” We know that we are wise to trust different people in different ways. Because I am a psychotherapist and the developer of a process called Integral Deep Listening, you can probably trust me to listen to you. I’m a good listener. However, if you then trust me to invest your money, do your taxes, or to wash your clothes, you will probably be disappointed. I may do such a lousy job that you decide you can’t even trust me to listen to you. So it is important that we identify who is trustworthy in what areas and to be content with that, remembering that there are other people in the world that are trustworthy in other areas. This is the dilemma you will have with Integral Life Practice. You may rightly think, “Wilber is a smart guy. He has a lot of quality recommendations. But how do I know which ones are right for me?” Wilber’s answer would perhaps be, “Experiment! Try a number of things! Keep the ones you like that seem to work and forget the rest!” “In addition, when you have resistances or problems, do the Shadow process and find out what is going on.” This is very good advice, as we will see in a minute. It heads you toward the source of goal setting that Integral Deep Listening teaches is the most important: your own inner compass. No one knows you like you do. Unfortunately, you don’t know yourself as well as you think you do. That’s why you need the objectivity of others. But most others don’t know you at all. Wilber doesn’t know you. Neither do any of his co-authors. I don’t know you. So who are we to tell you what goals would be best for you? The same could be said for your mother, your lover, your spiritual teacher, your therapist, or your best friend. They may all know you and deeply care about you, but they aren’t you. They may tell you they know what God wants for you or what your inner compass wants you to do or not do, but how do they know that? Did they ask it? Do they simply believe they know better than you do? Of course it may be true that they know better than you do, just as Wilber knows more about how to set up a successful integral life practice than you do, which is why you want to read his ideas. However, that doesn’t mean that he knows what your own inner compass is telling you to do or not do. He doesn’t know that. Might it not be a good idea to get a consult with your inner compass as you set out to develop your integral life practice? Let’s consider the following scenario. I am dead set on creating and following an integral life practice so that I feel secure, competent, and have validation that I am at a high level of development. But what if my inner compass doesn’t care about any of that? What if it wants me to accept myself for who I am, warts and all, and to pursue my integral life practice for completely different reasons? If I am blind to my own motivations and they don’t track with the agenda of my inner compass, what will happen? At some point the divergence between what I want for myself and what my inner compass wants for me may become so great that I sabotage my integral life practice. This is not a rare problem; it happens more often than not. There is a very good chance that it will happen to you too if you do not learn how to consult your inner compass. Wilber’s Shadow process is an attempt to do just that. However, it is limited because it is framed in terms of listening to your resistances. Shadow elements are unrecognized or disowned self-aspects that have a different agenda from your own. Integral Deep Listening frames internal listening in a different way. It does not view your inner compass as either disowned shadow or as a source of resistances. Instead, it views it as the source of your emerging potentials. These emerging potentials express themselves as the characters in your dreams and as the personifications of your life issues. As an example, let’s say that one life issue you have is to choose the correct integral life practice for yourself, which means one that is in alignment with the priorities of your inner compass. What feeling would that bring up for you? Let’s assume it’s fear of failure – that you’ll bite off too much or attempt something that creates too much resistance and you’ll fail. Let’s say that, when asked to give that fear a color, you say “Grey.” Now, imagine that the room is filled with that grey color. Watch it condense into some shape or form. It could be anything – a plant, animal, human, object. There’s no right answer! Now let’s imagine that your grey color congeals into a big elephant with giant tusks. We have just duplicated, in a sense, the night time dream creation process. We now have the equivalent of a dream character, but one that is the personification of your life issue, your fear of failure at your integral life practice. Now we can have you imaginatively take the role of your elephant (or whatever image you came up with) and answer a series of questions that have been carefully developed since 1981. Your job is to pretend you are the elephant and stay in role. You can hear what you think later; in response to these questions you want to hear what your elephant has to say! These questions are meant to confirm or deny that he is a personification of your inner compass and exists to help you develop an integral life practice that is supported by your inner compass. Now you may find that your elephant gives you all green lights: he may support all your efforts and have no suggestions for improvement. However, he may not only have recommendations; it is possible that he will have serious questions about your priorities and recommend a completely different set. If that happens, why should you trust a figment of your imagination? First, you don’t have to, and you shouldn’t. You need to trust your own common sense! Second, how does your elephant score itself in confidence, compassion, wisdom, acceptance, inner peace, and wisdom? These are six core qualities of enlightenment. If your elephant scores higher than you do in one or more of them, then it might be advisable that you consider that it is indeed an emerging potential that you have not yet grown into, and that has something to teach you. Third, you can consult with other dream characters or personifications of your life issues to see if you get validating or conflicting responses. Fourth, you can again check out what you learn with people you trust. Once you learn this simple interviewing procedure you can use it to monitor your entire integral life practice. You can use it not only to defuse resistances, as Wilber’s Shadow method does, but to align yourself more closely with the agenda of your inner compass. An example of the interviewing protocol can be found at . More information is available at that site, IntegralDeepListening.Com and at DreamYoga.Com. At DreamYoga.Com there is a comparison/contrast between Wilber’s Integral and Integral Deep Listening at: . There is also a comparison and contrast with Wilber’s Shadow methodology at . These comments are meant to increase your success at pursuing your own integral life practice. By all means, begin! Be patient with yourself. Be persistent. And HAVE FUN! This review is the second this author has done on a work by Wilber. The first is a review of his Integral Spirituality that can be found at .